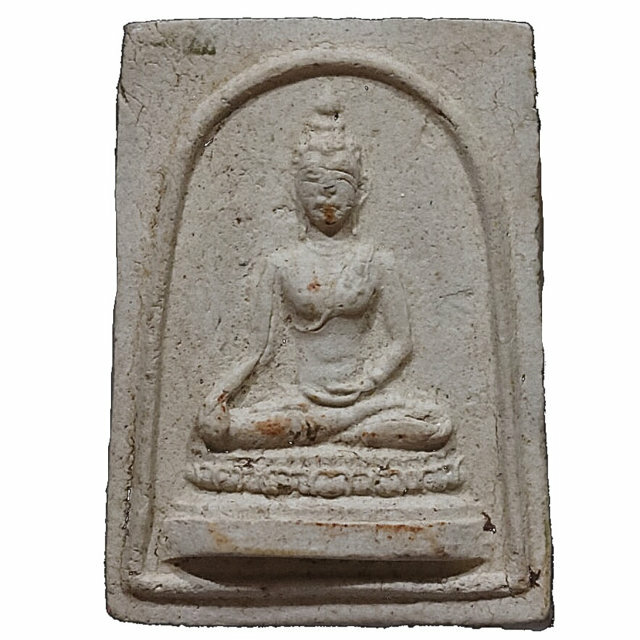 Pra Somdej Chiang Saen Sacred Powder Votive Tablet with Khom Agkhara inscription on rear face, from the 2512 BE Wat Chinorosaram Edition. An all time Classic amulet from a Nationally Famous and Historical Blessing Ceremony, which brought the amulets of this 2512 BE edition to become a Pra Niyom preferred class Sacred Amulet. Accepted by all major amulet appreciation societies, for the official documentation of the Blessing Ceremony, which saw the attendance of some of the Greatest Master-Monks of the time present to bestow their empowerment and blessings. The edition was blessed throughout the days of 22nd - 31st August 2512 BE. Amongst others, some of the more famous names present were the great Luang Por Guay (Wat Kositaram), Luang Phu To (Wat Pradoo Chimplee), Luang Por Prohm, of Wat Chong Kae, Luang Por Sukh (Wat Po Sai Tong), Ajarn Nam (Wat Don Sala), Luang Por Ming (Wat Gok, Thonburi) Luang Por Tiang (Wat Muang Chum), Luang Por Ngern (Wat Don Yai Horm), and Luang Por Dee (Wat Pra Roop). The amulet is extremely rare, because the devotees of all the aforementioned Guru Monks revere and collect the amulet for the blessings of their chosen Guru, which has caused devotees from each of these Masters who were present to empower, to collect and deplete the edition very quickly. The amulet is seen as a perfect alternative to other amulets of these Masters which are already almost impossible to find or afford, but in recent years, this Pim has also become less affordable as its rarity increases in time. Apart from the devotees of all masters collecting this amulet, the devotees of Luang Por Guay are the most fervent collectors, for it is recorded that Luang Por Guay remained seated after al other Momnks had left the ceremony, and meditated all night over them, empowering them till the dawn came. he was the last Monk to rise up from his seat, and this edition is considered by his devotees to have received an extremely powerful blessing from Luang Por Guay. The devotees of Luang Por Sukh of Wat Po Sai Tong, also have a special preference for the amulet, because Luang Por Sukh took a batch of them back to the temple of Wat Po Sai Tong, and empowered them once more in solitary for a Traimas Trimester. Luang Phu To of Wat Pradoo Chimplee was one of the greatest Masters of the Last Century, and a Highly revered Monk around the whole Kingdom of Thailand. he was Respected and revered by His Majesty Our great King, who was a close friend and companion. This Great Monk achieved his status through his Great deeds and his great Diligence in his Patipatā (Practice of Purity and Renunciation), and in his Great Attainments in Dhamma Pariyatti and Dhamma Patipatā. Luang Phu To was born on the 27th March 2429 BE. His many honorable awards of status reflect his great practice and diligence, and his amulets are amongst the top ten Masters of the twentieth century, and amongst the rarest and most highly sought after in the world. His amulets are amongst the most highly sought after Pra Niyom Category Amulets, which are seen to grace the pages every important amulet encyclopedia. The amulets of Luang Phu To are highly prized and jealously guarded treasures of the high end collector and devotee. Luang Por Prohm of Wat Chong Kae was one of the more prominently revered and sought after amulet Masters, means that between his true devotees and worshippers, and the Collector and Appreciation Societies, his amulets are far and few between to come by. He was one of the most highly revered Guru Monks of his Era, and his amulets are amongst the most highly preferred with Collectors in the Amulet Appreciation Society. 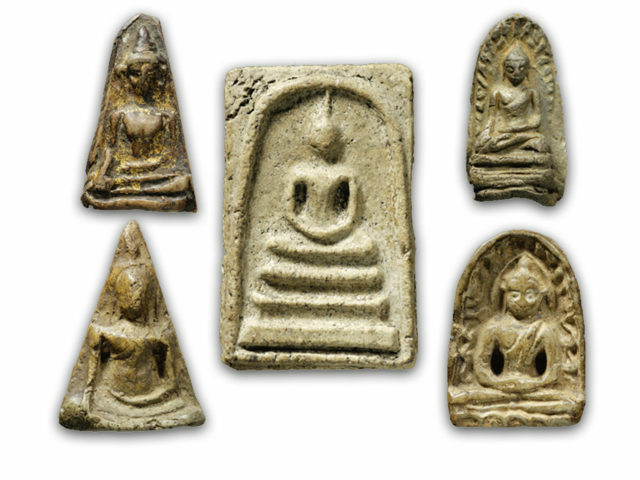 Mostly, the amulets of Luang Por Prohm fetch elevated prices, and are not often seen outside of the high class collector's showcases. His amulets are mostly hard to find these days, as they have been to the most part collected and kept in the private collections of aficionados and devotees of this Genre of Amulets, and can be considered a rare find to see any amulet of any edition from this Great Master. Luang Phu Dee is a Very revered and Historically Famous Gaeji Ajarn of the Supannburi Province, with a large following of Devotees on a National, and International scale. His Patipata (Life's Practice) was that of a Pure and Humble Monk whose diligent effort was seen by the Devotees to be that of a True Bhikkhu worthy of Reverence, and an Arya Sangha who stands amongst the Greatest Names in the History of Thailand. Luang Por Ngern was mostly known for Kong Grapan Chadtri Klaew Klaad Maha Ud Magic and less for Metta Mahaniyom Mercy Charm or Maha Sanaeh Enchantments. His Kong Grapan Chadtri Klaew Klaad Magic was and is second to none for protective amulets. Luang Por Ngern Jantasuwanno, of Wat Don Yai Horm (Official Ordained Name; Pra Racha Tammaporn), was known as the Taep Jao of Wat Don Yai Horm, and was extremely famous for his amulets, which are renowned for their Kong Grapan Chadtri, Klaew Klaad, Metta Maha Niyom, and Maha Lap Powers. He was a 'Pra Nak Pattana', which is the term given to a Monk who specialised in developing temples and Building Shrine Rooms, and local facilities for the common folk, such as schools and hospitals, to make merits helping living beings, to alleviate their sufferings.